Hi guys, hope you are still enjoying your free 100mb and 1GB on MTN wow weekend. MTN Nigeria has released another good offer to all its subscribers, this offer costs N2000 for 7GB, which represents a 100% bonus on the initial plan which costs N2000 for 3.5GB. 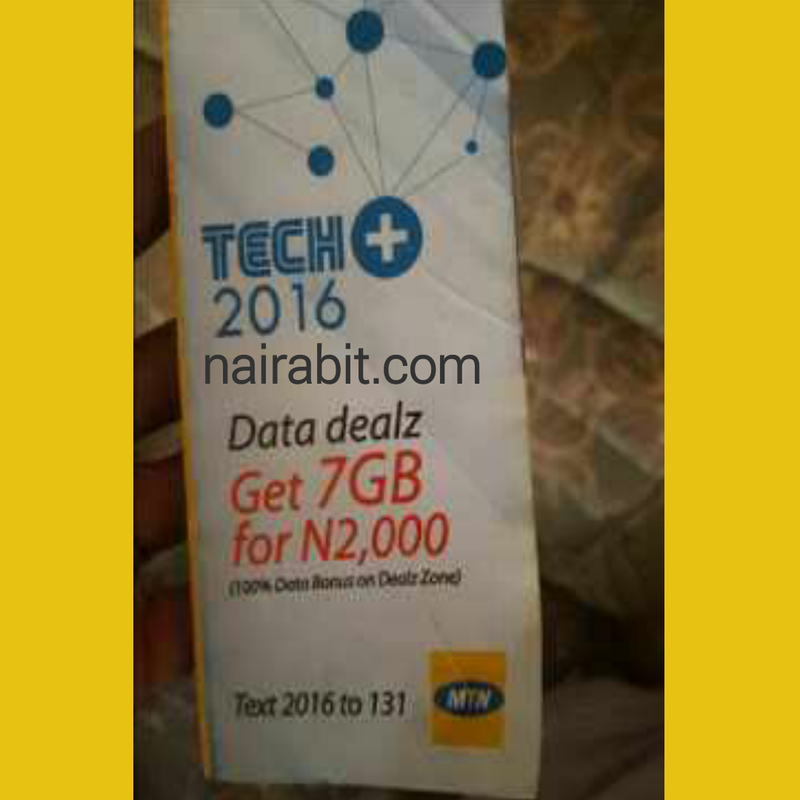 This MTN 2016 data deal was officially announced at this year's TechPlus event held in Lagos. This TechPlus event brought together, experts in the tech world together celebrating the impact of digital technology in Africa whilst calibrating the technological future of the African continent. The data lasts for 30days, and did I mention that if you play smart you could get 8GB instead of 7GB for the same N2000. Update: This promo from MTN ends 12midnite on Saturday 23rd July. • Send a text message with the word "2016" to "131"
• You will receive a confirmation message. This method only works on weekends, because it requires getting free 1GB data on recharges above N500, so when you recharge N2000(N1000 ×2), MTN gives you extra 2GB. If you have read the post on MTN Wow Weekend, you should know that your N2000 will still be intact. 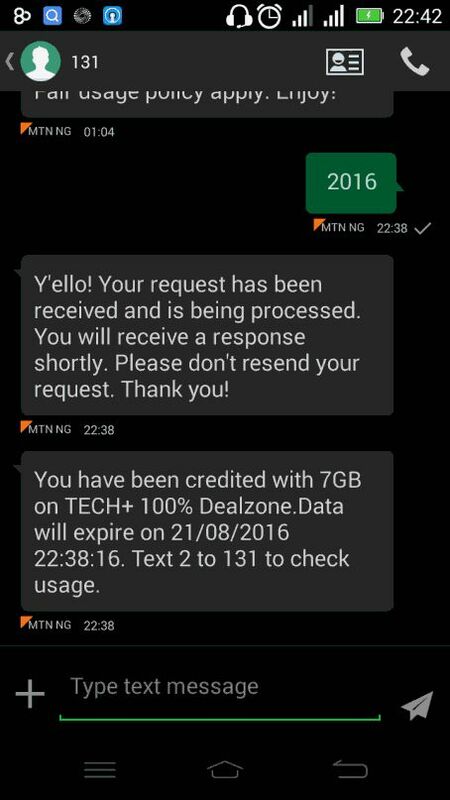 So you can use the N2000 to subscribe for MTN 2016 Data Deal which gives 7GB making it a total of 9GB. To get 11GB instead of 9GB, it will cost N2,004 (two thousand and four naira) and also requires using the "Arsene Wenger Tactics" . Remember, MTN only gives bonus of 1GB on recharges above 500, recharging N500 might get you 100MB instead of 1GB and they only have N500, N750..., recharge cards. The closest recharge card after N500 is N750, so should you recharge 750 four times to get 1GB four times (4GB)? That will be too expensive You can use ATM for e-top up, this way you can recharge N501 four times (N501 × N4 = N2004), getting 1GB on each, making a total of 4GB. 4GB plus 7Gb equals 11GB. I'm positive better day are ahead in this data war, Enjoy your data. Always visit nairabit homepage everyday for latest updates, you can also stay connected both offline and online by using Nairabit Android App.